Fernando Alonso finished his testing duties for the second preseason test on top of the time sheets and hands over the F138 to Felipe Massa for the final day of testing. 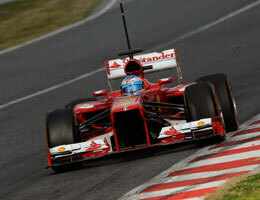 His time of 1.21.875 was marginally slower than Sergio Perez's best time set on day two. Fernando set his fastest lap on a short fueled run booted with the soft compound tyre before switching to race simulations after lunch. Nico Hulkenberg set a strong time to end up second for the day in his Sauber after racking up 91 laps. Lotus seemed to have sorted out the issues with the E21 that plagued Kimi on the first two days of testing. Romain Grosjean scored the most laps of the day to end just a couple of hundredths off the Saubers pace. The Lotus and the Mercedes seem to have similar long run pace, while the black and gold car is rumored to be the best on the grid. Rosberg in the W04 was busy gathering data on long runs and spent the day comparing performance on the soft, medium and hard tyre compounds. The cold and overcast weather was causing graining on the tyres and with the already faster wearing Pirelli's, Nico and almost all the drivers were complaining about the lack of grip after just one lap. Williams opted to split the time in the car for the day, with both drivers spending half a day around the Spanish track. 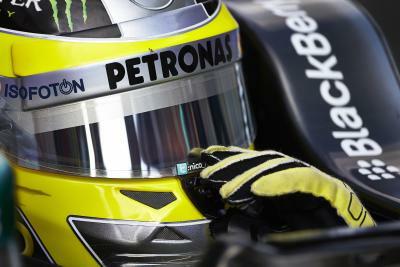 Pastor was trading fastest lap times all morning with Alonso, but ended up fifth ahead of his rookie team mate Bottas. Button was not too happy with the McLaren and they seem to be having trouble getting consistent times out of the car. Even though McLaren finished with a race winning car in 2012 they have, in contrast, to all the other teams started the season with an all new car and not an evolved car like all their rivals. Button explained that if they had just evolved the car from last year, "I think after three or four races we would have realised that we were at the end of the development curve for the car." Sutil had a good return to Formula one finishing just one second off the pace of the Ferrari and he is looking good to bag that coveted last race seat on the grid. With Jules Bianchi getting his shot to show what he can do with the car on day four, it seems as though Sutil has done his bit, and the shareholders of Force India are set to decide on their second driver by next week. The sister teams of Red Bull and Toro Rosso ended in ninth and tenth respectively followed by Chilton in the Marussia and Van de Garde in the Caterham. An interesting bit of news is that Max Chiltons father is rumored to be buying a stake in the Marussia team for every year his son races for them. Given that he has a three year contract, it is not hard to imagine Team Chilton in 2015 or 2016.